Motion-activated design Automatically records once motion is detected, then sends you alarm notifications. 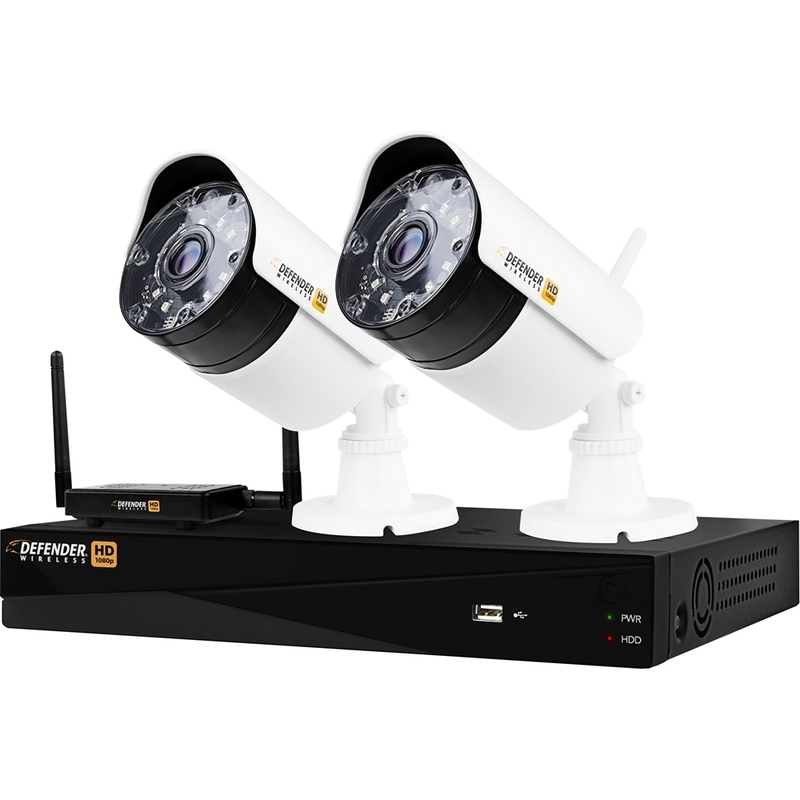 Monitor your property with 2 cameras Includes Defender WHDCB1 cameras for recording Full HD video for widescreen viewing. View and record from up to 4 channels Add up to 2 more cameras of your choice for 4-channel simultaneous monitoring. Set and forget with hard drive storage Record continuously from 4 channels with a 1TB hard drive. High-resolution technology captures superior footage 1080p resolution cameras use CMOS image sensors to record larger, clearer full-screen video. Powerful night vision up to 130 ft. Allows you to monitor your home or business, even in dim lighting, automatically switching the picture to black-and-white in low-light conditions. Viewing angle up to 70° Expertly captures a wide angle of your property for exceptional security at all times. Durable camera housing Included cameras are made of an ultra-lightweight polycarbonate vandal resistant housing and IP65 rated for weather resistance. HDMI and VGA outputs Connect to a wide range of compatible displays for versatile viewing, including your HDTV, LCD or plasma TV. USB connectivity makes it easy to transfer stored footage. Remote viewing with the free Defender’s app Lets you get the live stream from your home. Also, the app grants an access to recorded footage. ClearVu Smart Signal adaptive technology Uses FHSS (Frequency Hopping Spread Spectrum) to minimize signal interference and provide a reliable, uninterrupted viewing experience without disrupting your Wi-Fi network. Digital wireless technology Allows you to reach those hard to reach areas like the garage, shed or parking lot. Flexible recording options Allow you to monitor continuously, enable motion detection or tailor a schedule to fit your lifestyle. Mountable camera design For flexible placement option.